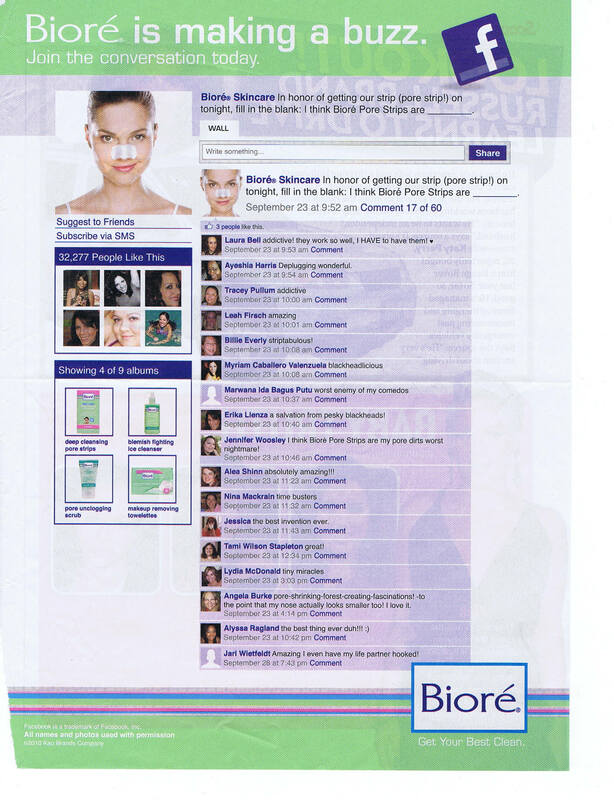 Sixty Biore Facebook Fans commented and a handful were selected and agreed to be featured on the print ad in People. What a clever way to generate a plain folks, bandwagon testimonial ad for a national magazine. When the art was put together they had 32,277 fans and as of today that has jumped to 45,094 (almost a 40% increase). This idea has value in the life sciences corner of the marketing world. I can imagine a company with patient-facing messages using social capital to illustrate the patient value proposition to clinicians waiting for patients to ask for branded treatments. Execution of this advertisement idea would be completely unexpected in a medical journal. I suspect would generate a fair amount of chatter–positive, negative and neutral; however there would be a conversation happening around THAT product. I hope to be on the front lines of THAT product’s marketing very soon.